Heirloom tomatoes are one of the highlights of summer produce here at Union Market, but what does “heirloom” mean anyway, and why are these funky looking tomatoes so special? Heirloom refers to varieties of tomatoes whose seeds have traditionally been handed down from generation to generation of farmer and culled from each year’s harvest. 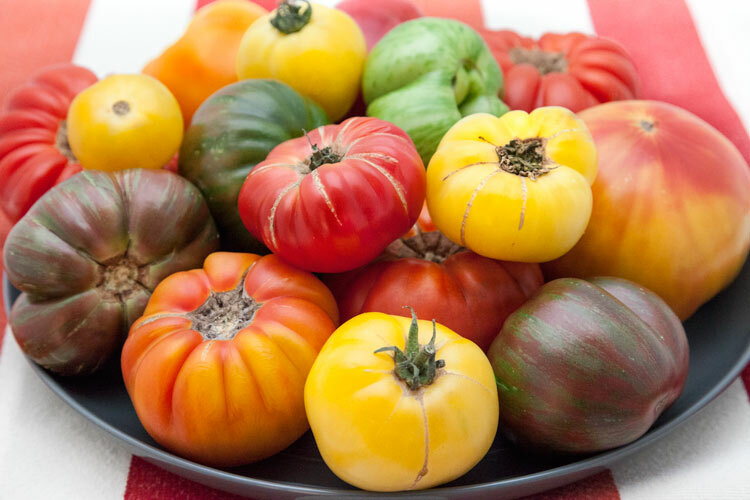 Heirlooms are by definition open-pollinated, meaning they’re not hybrid breeds that have been developed specifically to resist disease and preserve shelf life. Heirlooms tend to be grown seasonally rather than year-round, and their dramatic appearance and wide range of shapes, colors, and sizes, all set them apart from their more prosaic hybrid cousins. Heirloom tomatoes also have a much more robust flavor and sweeter taste. Typical supermarket tomatoes, on the other hand, were bred to withstand traveling great distances and to have a uniform appearance—characteristics that are important in commercial agriculture, but that often come at the expense of flavor and sweetness. We love being able to bring our customers local heirlooms, like the organic cocktail and cherry heirloom tomatoes from our friends at Hepworth Farms in the Hudson Valley, available in our stores while the season lasts. Because Hepworth Farms’ tomatoes are grown so close to New York City, they can be vine-ripened for maximum sweetness before arriving here. The heirloom season generally runs from late summer into the fall, with local heirlooms first appearing around late July or early August. Below are just a few of the many interesting cultivars you’ll find at Union Market, along with tasting notes and serving suggestions. A small tomato with a big flavor that’s best described as tart, tangy, and almost lemony. Its bright green skin is overlaid with yellow-green stripes, and its firm texture means that it’s fantastic for sautéing or grilling. Deep purple-red, with mottled coloring that runs all through the flesh, the famously rich flavor of Cherokee Purples make them one of the most popular heirloom varieties. The flavor is earthy and refreshingly sweet, and it pairs well with other big flavors like blue cheese, olives, and grilled meats. The ultimate beefsteak tomato! Higher in sugar and acidity than most varieties, Brandywines have complex sweet, spicy flavor and often grow to weigh over one pound each. The skin is smooth and deeply colored, and the flesh is supple, meaty, and juicy. Best eaten fresh in salads. A striking yellow beefsteak with vibrant red streaks that run straight through the flesh. They’re very sweet and fruity but low in acidity, making the flavor rich and mellow, and perfect for pairing with creamy burrata or mozzarella. Japanese Blacks are actually more burgundy with brown overtones and are usually pear-shaped. They have a perfect acidity level with sweet, slightly smoky flavor and soft, silky flesh. They’re a terrific accompaniment to anything fresh off the grill. Huge, pale, ivory-colored beefsteaks that can sometimes weigh up to two pounds each! The flavor is mild, sweet, and juicy. Its flesh is dense with very few seeds, and when ripe, its blossom end turns slightly golden. This is a great tomato for eating fresh, as well as a good choice for soups, stews, and sauces. Shaped almost like a strawberry, oxhearts come in two varieties. The Pineapple is bright orange with pink stripes, and is mild and meaty with very few seeds, while the Rose is pinkish-red with a sweet, fresh flavor and aroma. Get a couple of each to make a wickedly beautiful fresh salsa or marinara sauce. A dazzling orange large grape tomato with beautiful purple shading on its shoulders, whose low acidity and refreshingly sweet flavor is amazing on salads or skewered with meat and veggies on the grill. An eye-catching cherry-type tomato with incredible lime green striping on its red flesh. This one is such a showstopper that we like to throw it into salads whole so that its complex flavor can shine, although its firm texture and thicker skin make it great for roasting or grilling as well. These elongated little golden tomatoes have a striking red blush flecked with a delicate green striping that becomes more pronounced along with the interior marbling as the tomato ripens. The flavor is versatile and pleasantly sweet-tart, making these great for snacking on raw. Its name means “Yellow Flame” in French, and it’s not hard to see why: the bright yellow-orange coloring of a Jaunne Flamme is hard to miss. These small, round tomatoes are fruity, citrusy, and sweet; they’re perfect for roasting whole or eating fresh.